The first trailer and poster have been released for 2019’s Where’d You Go, Bernadette starring two-time Oscar winner Cate Blanchett (Blue Jasmine, The Aviator). Blanchett plays the titular role, and the trailer shows she’s off on some adventure leaving her family to follow the clues and track her down. In addition to Cate Blanchett, the comedy/drama features Billy Crudup (Alien: Covenant), Kristen Wiig (The Last Man on Earth), Emma Nelson (Margaret and the Moon), James Urbaniak (The Venture Bros), Judy Greer (Halloween), Troian Bellisario (Pretty Little Liars), Zoe Chao (Strangers), and Laurence Fishburne (Last Flag Flying). Richard Linklater, Holly Gent, and Vince Palmo adapted Maria Semple’s bestselling book for the screen. Five-time Oscar nominee Linklater (Before Sunset, Before Midnight, Boyhood) directed the film adaptation. Nina Jacobson, Brad Simpson, and Ginger Sledge produced, with Megan Ellison and Jillian Longnecker executive producing. Linklater’s behind the scenes team includes director of photography Shane F Kelly, editor Sandra Adair, production designer Bruce Curtis, and costume designer Kari Perkins. Annapurna Pictures’ Where’d You Go, Bernadette is scheduled to open in theaters on March 22, 2019. Where’d You Go, Bernadette is based on the runaway bestseller about Bernadette Fox, a Seattle woman who had it all – a loving husband and a brilliant daughter. When she unexpectedly disappears, her family sets off on an exciting adventure to solve the mystery of where she might have gone. 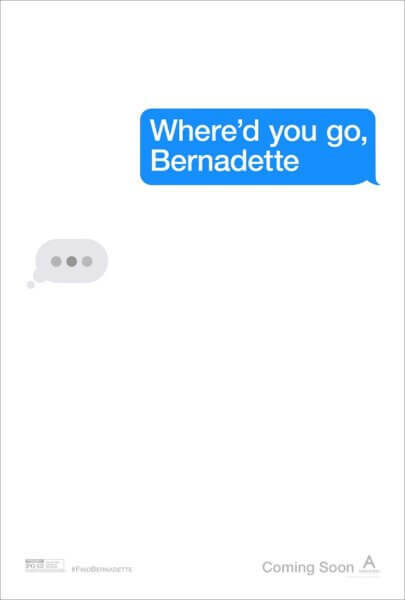 Poster for 2019’s ‘Where’d You Go, Bernadette’ with Cate Blanchett.